View settings can be customized through the Vector|Options menu. Sets the backgound color for image view windows. Use native colors - all vector objects visualized in source raster colors. Show polygones as frames - polygones not filled (transparent). Polyline color - color of polylines when Use native colors option is off. Closed polyline color - color of closed polylines when Use native colors option is off. 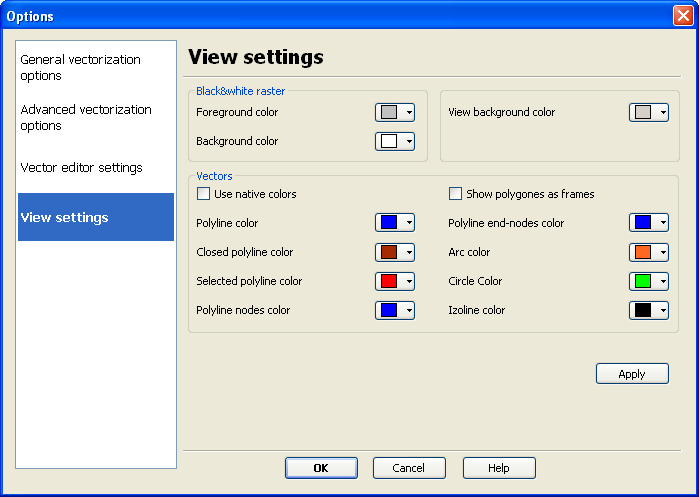 Selected polyline color - color for polyline highlite when it selected for edit operations. Polyline nodes color - color for polyline nodes exclude the first and the last. Polyline end nodes color - color for first and last polyline nodes. Arc color - color of arcs when Use native colors option is off. Circle color - color of circles when Use native colors option is off. Izoline color - color of polylines with height (Z-coordinate) attribute when Use native colors option is off.